While creating SS-11 we were guided by the motto - minimum size with maximum functionality for full tube overdrive with the highest quality components. The SS-11 is brother to the SS-20, but designed to be different. While the SS-20 is the more aggressive "METAL" pedal, the SS-11 was intended and manufactured for that famous CLASSIC tube driven over saturated guitar tone that eveyone loves and craves. - Fully tube-based 4 - stage overdrive channel with DUAL TUBE design (2x12AX7 or 2x6Н2П-ЕВ tubes) with high-voltage anode voltage (+300 V). - Individual gain sensitivity and output level controls for clean and crunch/lead channels. - TREBLE SHIFT toggle switch to enter bright mode for that added punch of high end. - FX LOOP for external effects. 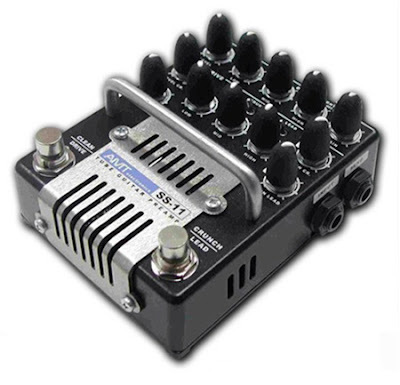 - OUTPUT jack for connecting to both specialized guitar amplifiers with a standard level of 0 dB (GUITAR AMP mode) and a CAB SIM MIXER out with a standard level of -10dB and a guitar cabinet simulation. - The preamp outputs are equipped with sophisticated solid-state buffers. - SS-11 incorporates new field-effect transistor-based guitar cabinet impulse response emulator prossessing. Improved naturalness of sound when connected to line input. - Special attention was paid to transistors anode power quality: preamp uses a specially designed high-voltage transformer minimizing the penetration of impulse noises into amplified signal. LEAD channel provides thick viscous sound for playing both chunky rhythm parts and singing solos with excellent presence. TREBLE SHIFT toggle to take your lead sound into bright mode, similar to the good old "Treble Booster" pedals in the 80's that guitarists used to enhance their solos. OVERDRIVE channel features a more open structure of the sound. This is the SS-11's sweet spot! VERY tubey and saturated sounding, much like that of the classic tube amps of the 70's and 80's! Wide range of sensitivity adjustment results in the sound starting from light crunch to thick and bright lead channel-like sound. Natural tube tone. If you're looking for something other than that dull sounding solid-state OD or TS clone sound, then THIS IS IT. The P1 Legend Amp Series pedal was designed similar in tone to one of the most esteemed amplifiers, the 5150*. 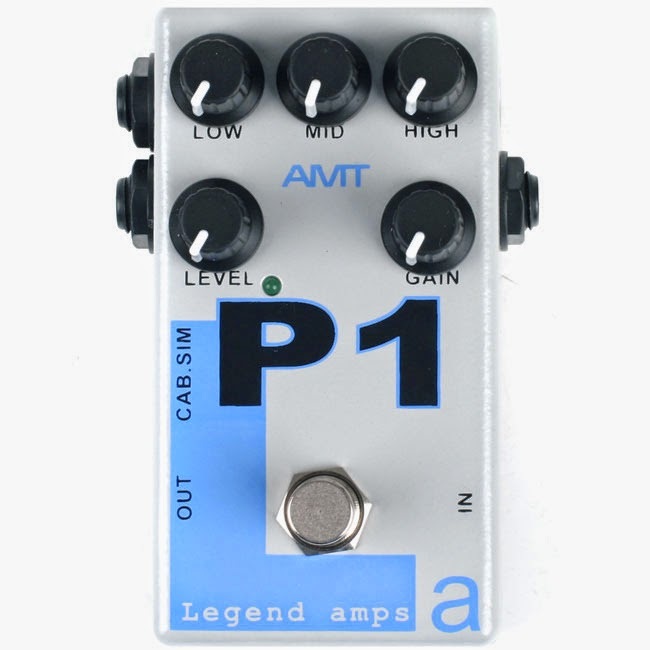 The sound of the AMT P1 is rich and full in tone, providing tube-like rock distortion. Well defined, clean, clear, cutting, crunchy distortion is what the P1's all about. 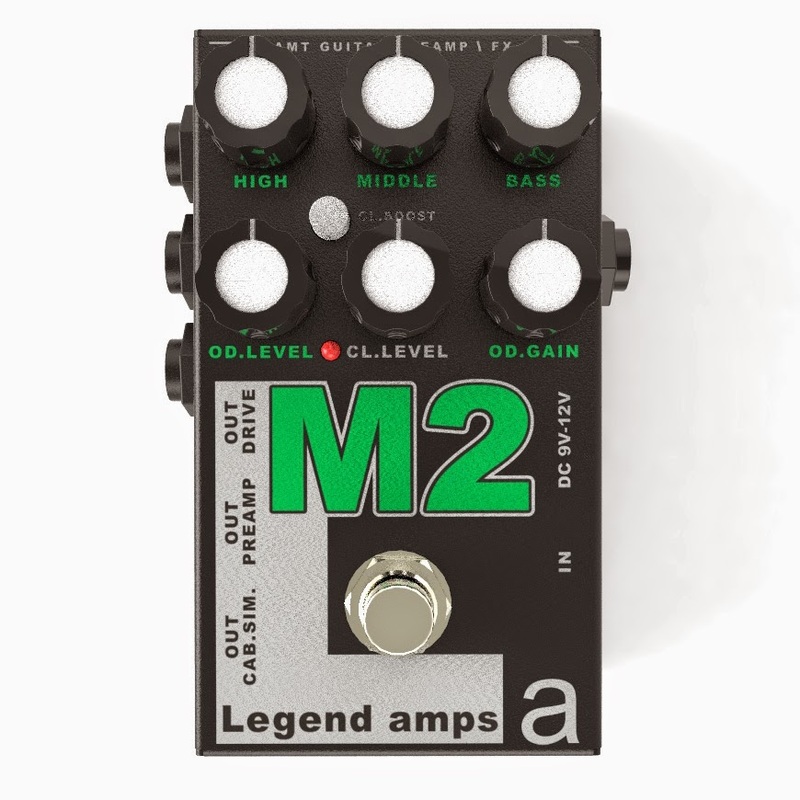 The AMT Legend Amp Series guitar pedals provide excellent dynamics, nuances, and characteristics similar to that of tube driven amplifiers. Tube-like range of volume control provides great sound density, playability, and power when playing at full volume and also in conjunction with your guitars volume knob. TRUE BYPASS. 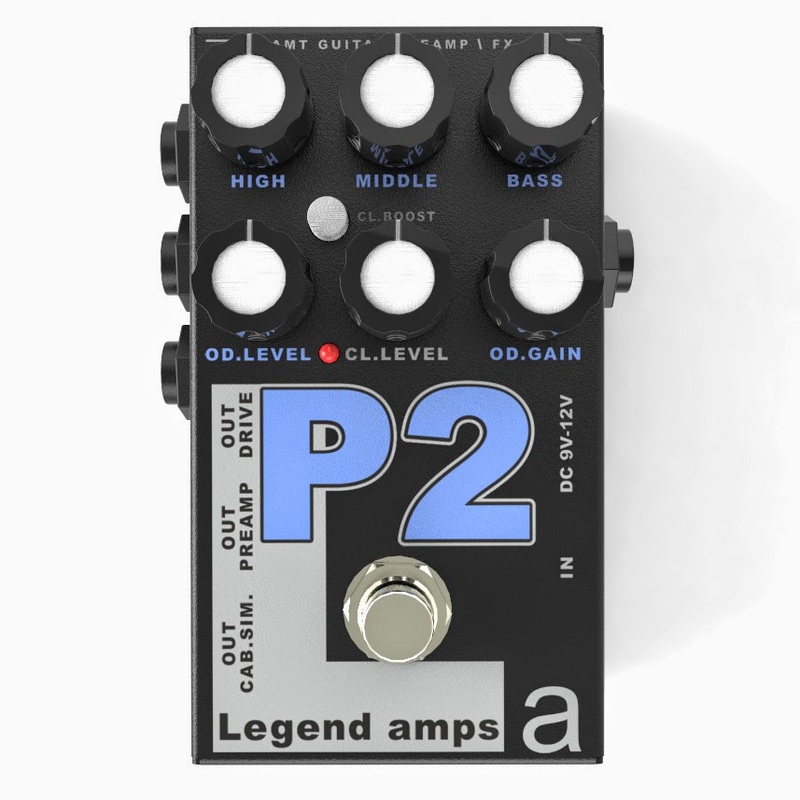 The preamps of the Legend Amp Series pedals use passive true bypass circuitry, therefore no loss of guitar signal is noticed in your pedal chain. Similar to if no pedal was there at all when bypassed. Features high level of output signal (+10dB in extreme position of Level knob) corresponds to the output levels similar of tube preamps. Thus, you have adjustable signal level allowing to hook up your preamp AND direct input of a power amplifier. Controls include LEVEL, GAIN, LOW, MID, and HIGH. TWO signal outputs: DIRECT AMPLIFIER OUT for guitar amplifier use and CAB SIMULATION OUT for mixer, or studio use. The S1 Legend Amp Series pedal! Enormously rich smooth overdrive to medium gain crunch to screaming lead, the S1 was designed for players looking to achieve the famous guitar distortion sounds of Soldano* Amplifiers. 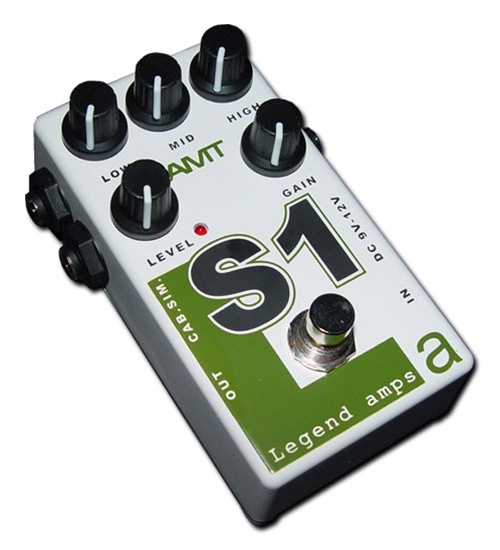 The S1 features JFET circuit design producing crazy tight and responsive distortion. 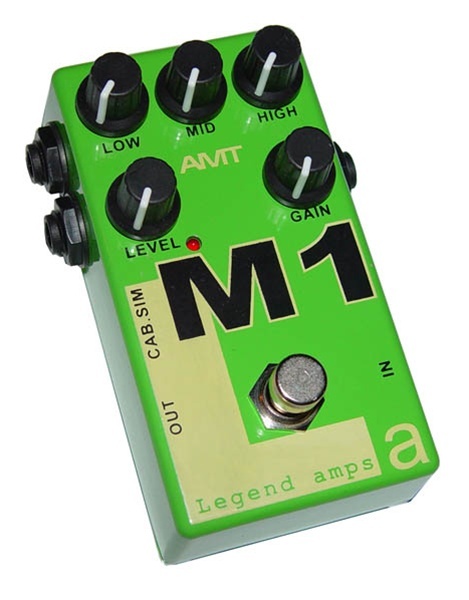 Make ANY amp sound like a high Soldano* with the AMT S1 pedal. Need a good sound for direct recording? Tired of messing with mics, preamps, and other expensive recording gear? Try the S1's CAB OUT direct into your DAW for some of the best direct sound you've ever heard. Just listen to the direct CAB OUT demo! Warning! The AMT Legend Amps like any top class devices are very sensitive to power source quality. To power the devices of the series we do recommend you to use either 9V battery or power adapters meeting the necessary quality requirements (we recommend АМТ 9V/800mA power adapter). 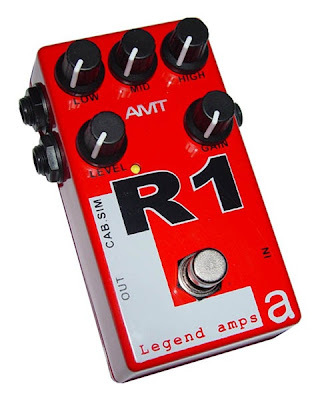 AMT R1 LEGEND AMP SERIES RECTIFIER. 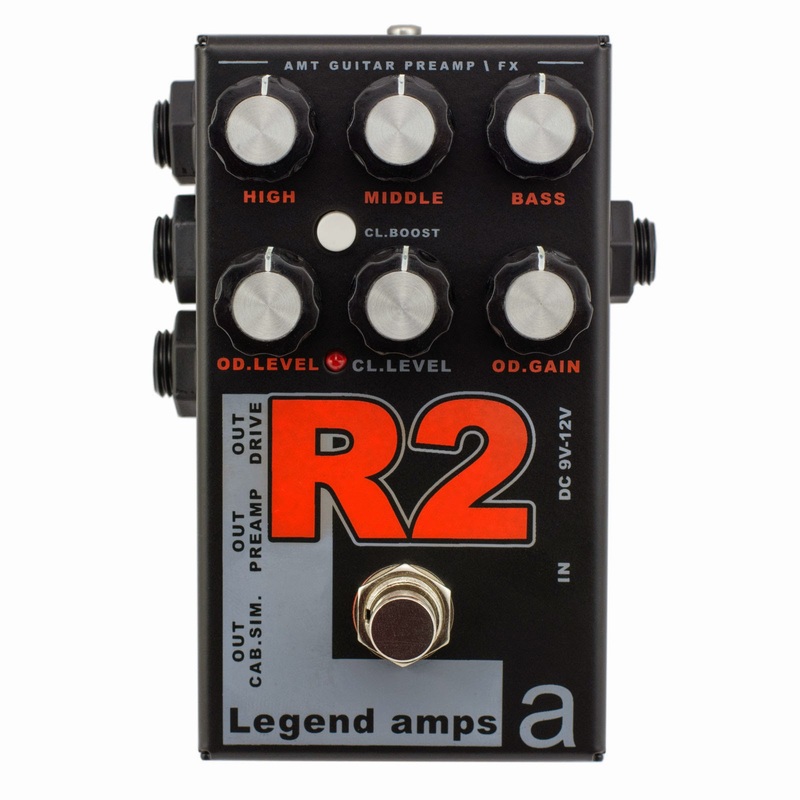 The R1 Legend Amp Series pedal, one of most sought after high gain modern amplifiers now in pedal form, the Mesa Triple Rectifer*. Huge ultra modern distortion tone now able to fit on your crowded pedalboard. Sparkling tight chunky rhythm that will impress even the most demanding ears, and cutting powerful leads to make you stand out through any mix. 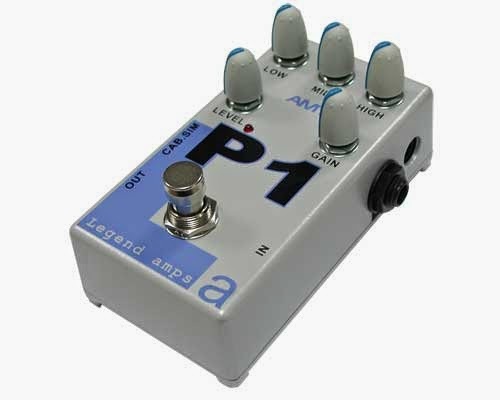 If you're the player who likes your gain on 10, then this one goes to 11+. 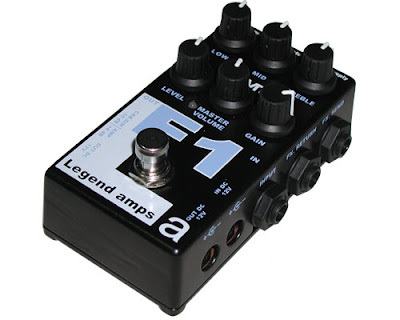 Legend Amps F-1 guitar preamp is intended for studio use and live performances. “AMT Legend Amps” is a new revolutionary series of one-channel preamps (JFET-preamps) from AMT Electronics, developed with principally new approach to guitar sound formation. The technology of analog modeling of the physical processes occurring in real vacuum tube limiting the guitar signals was used as the basis for the new guitar pedals series. It became possible due to the application of original circuitry solutions. The series’ channels structuring conforms to the processes occurring in real tube-based devices. It results in formation of the structure of limitation, dynamics and range close to he ones used in popular tube amplifiers. • Preamps included into AMT Legend Amps series provide excellent playing dynamics characteristic to real tube-based devices and are in no way inferior to them. • With the limitation range similar to tube channel the preamps of the series ensure terrific thickness and power to the resulting sound. Working with AMT Legend Amps preamps you won’t feel the urge to cut out the most informative middle frequencies, which in turn will provide great readability of your guitar in the sound mix. 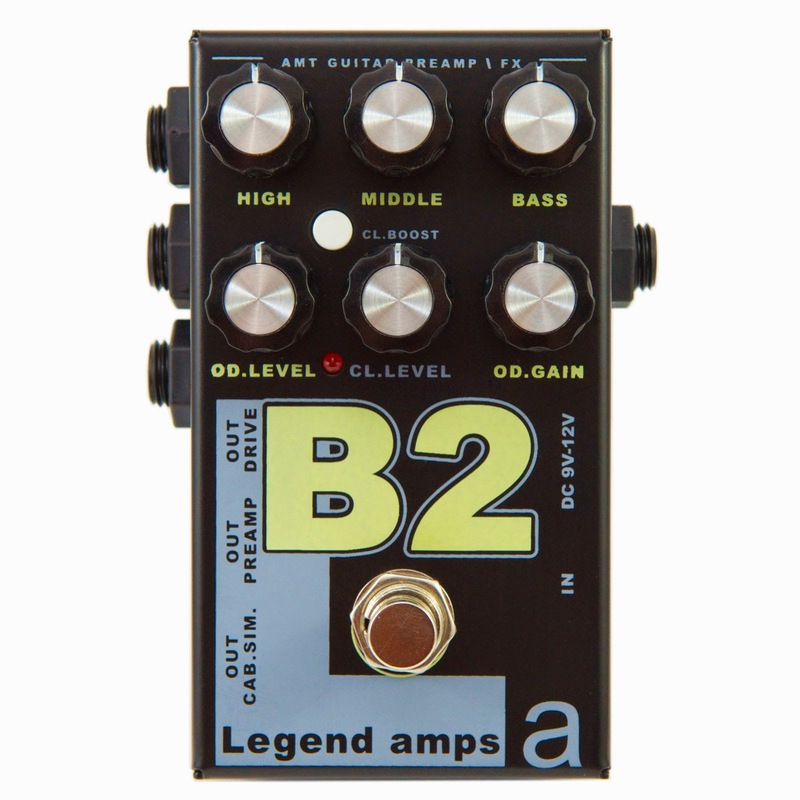 • Like tube preamps AMT Legend amps provide gradual increase of the limiting stages number as the gain grows. • The series’ preamps use passive circuits of tone shaping which are in full conformity with the tone controls during original tube overdrives. • The high level of output signal of AMT Legend Amps (+10 dB at max Level position) corresponds to the tube preamps’ output signal levels. Thus you have adjustable signal level which makes it possible to connect the preamps to any input (RETURN, DIRECT, LINE etc.) including INPUT POWER AMP. AMT F-1 is the first among the basic modules of the entire AMT Legend Amps series. You can use AMT F-1 to build a complex of multi-channel preamp from mono channels of AMT Legend Amps series - P-1, B-1, M-1, R-1, S-1. The series is constantly expanding thus giving you a chance to obtain a unique 100% analog tool for your guitar sound shaping. 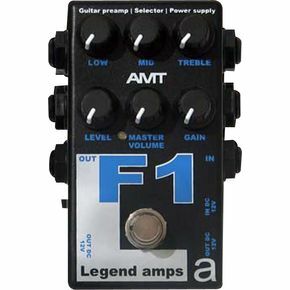 AMT F-1 is a preamp with internal CLEAN channel and the possibility of switching to external channel (any auxiliary overdrive effect) by means of a fot switch. AMT F-1 has the insert loop of serial type with standard -10dB level intended for connection of auxiliary effects and boosting the effect signal to standard 0dB level or higher (MASTER VOLUME), which is sufficient to operate directly with power amplifier. In case of connection to a mixer the preamp has speaker simulator mode. The mode can be selected by the switch loicated on the left panel of the device. AMT F-1 provides the built-in power hub to supply 9…12V to external channel and auxiliary effects. The bottom of AMT F-1 (under the box’s cover) has FX. Loop mode switch serial/parallel which significantly expands your choices. In case of connection to Ch. send, Ch. return AMT F-1 preamp there is a bi-color LED indicator (located on the front panel): Clean channel AMT F-1 - green, Lead external channel - red. If AMT F-1 is used in mono mode (without external overdriven channels) the LED is single-colored and the footswitch acts as «Bypass» Clean channel AMT F-1. Sound Engineer! Rental companies! Rental studios! Nyari speaker aktif serba guna yg paling mantap tapi harga masih sopan? 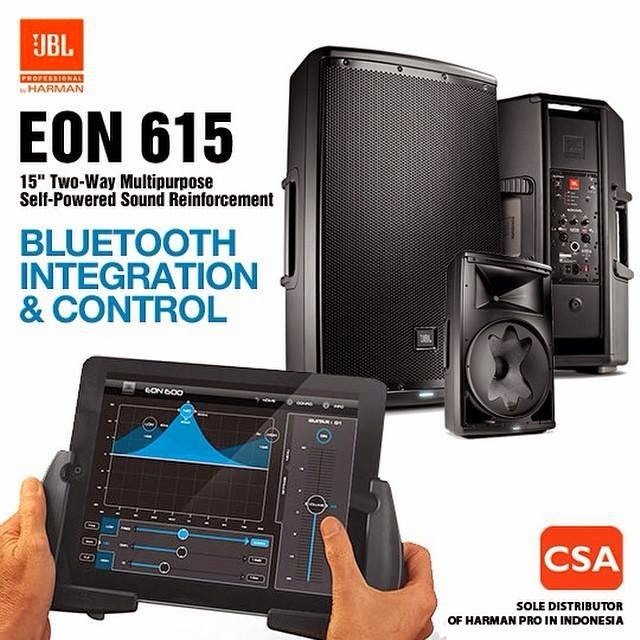 Ga ada lagi selain #JBL Eon 615. 2 way, 15", super power 1000 watt dg JBL wave guide yg diturunin dari line array JBL VTX, onboard DSP & get this! Wireless remote control via Bluetooth. Pastikan anda mendapat garansi resmi dari CSA untuk memastikan keaslian produk harmanpro yang anda beli.